iOptron improved their ZEQ25 mount to create the CEM25EC GoTo EQ Mount. It features a motorized equatorial mount, Go2Nova 8408 computer hand controller, a 1.5" stainless steel adjustable tripod, the AccuAlign illuminated polar scope, and hard carrying case for the mount. A unique center-balanced "Z" design puts the payload weight at the center of gravity for enhanced natural stability and greater weight-to-payload capacity ratio. Its built-in 32-channel GPS receiver transmits accurate location and day/date/time to the hand controller, so when you change your position, the telescope can be set up quickly with accurate information. For precise tracking, as required during long-exposure astrophotography or observation sessions, the CEM25EC has micro stepper motors with digital encoders to precisely track the mount's position plus the capability for you to program out the Periodic Error Correction (PEC) common to all worm gears. Even before the PEC has been compensated for, the mount has an impressive periodic error of less than 0.3 arc seconds. 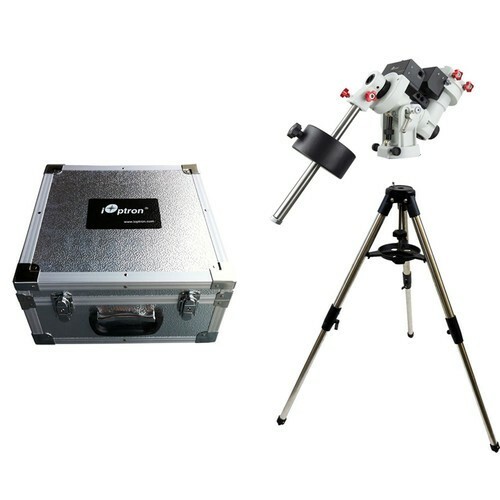 With a maximum payload capacity of up to 27 lb, this mount is ideal for most medium to large refractor, reflector, or catadioptric OTAs with Vixen-style dovetail plates and still be able to handle imaging rigs. A 1.5" adjustable-height stainless steel tripod, designed for this mount, is included. It features a metal accessory tray that locks the legs in-place for added stability and spiked feet to put it on a sure footing in rough or loose ground. To safely store and carry the iEQ45, a hard aluminum carrying case is also provided. It features a sturdy piano hinge, with dual locks and lock-holes for security. On the inside, custom cut foam padding perfectly protects the mount.